We have sold dumbbells (hand weights) to dozens of barre studios across the country. The neoprene covering is comfortable to hold and has a soft feel to it. 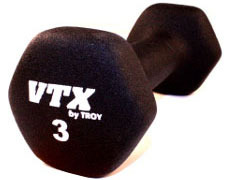 Both heads of each dumbbell have a stamped white "Troy VTX" logo on them, as well as the numbered weight. The black and white coloring fits into any atmosphere without looking tacky. 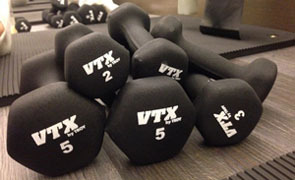 These dumbbells are available in sizes from 1lb up to 15lb, in 1lb increments. Most of our barre studio customers get a pile of each of a few sizes such as 2, 3 and 5lb. Occasionally a barre studio will get few of the larger sizes up to 10lb. If you need some place to store them, we have a dumbbell rack meant especially for these. 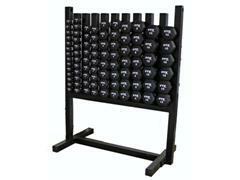 The rack will hold dozens of pairs of dumbbells, depending on what size dumbbells you get. An optional set of wheels makes storing them in a corner easy.